Did everyone have a nice long weekend? Did you shoot fireworks….or just watch? Was the weather nice where you were? My weekend was nice and I didn’t shoot fireworks or go to any fireworks displays and the weather here was perfect!! I spent most of the weekend in the Owen Workshop and this is one of the projects I finished up. It didn’t start out as a game table…. it was a game board and a table base. I purchased the table base at a flea market shop many months ago. The curvy lets caught my attention. The legs also fold flat….or they did until we attached the top to them. 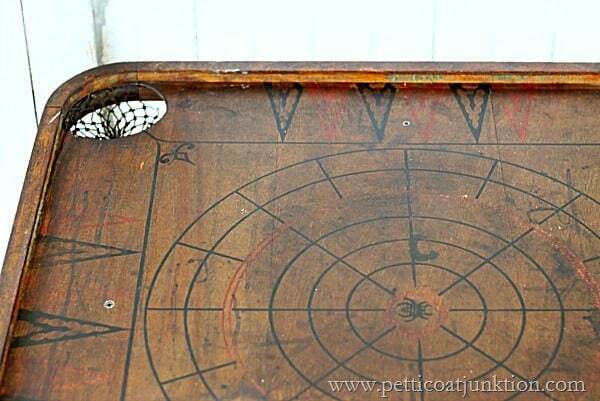 I got the vintage game board last month at the Nashville Flea Market from The Heartland Hoarder. I’m a sucker for pieces like this. The JTS had to cut some screws from the bottom of the game board. Then he added boards to one of the leg pairs to make them flush with the other leg pair. The JTS does a lot of behind the scenes things that don’t ever get caught on camera. I would be lost without him. All put together but not cleaned up yet. 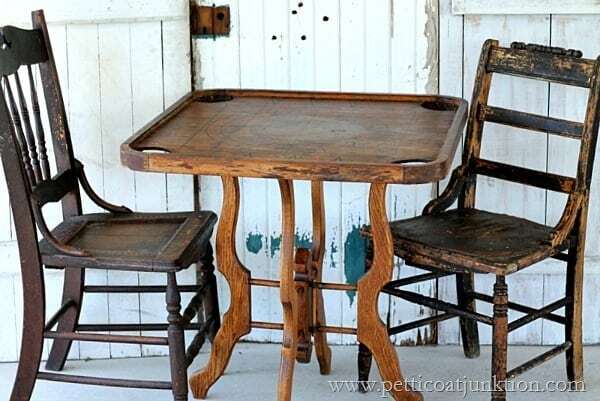 I wiped the table down with simple green and then used hemp oil to revive the finish. 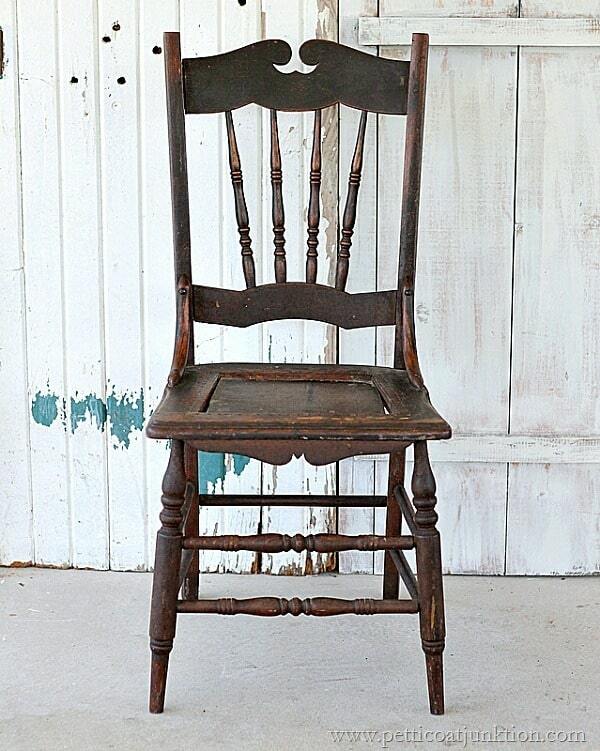 I didn’t want to mess with the aged finish….imperfections and all. Can you see the spider in the middle of the design? I also freshened the finish on this chair with hemp oil. 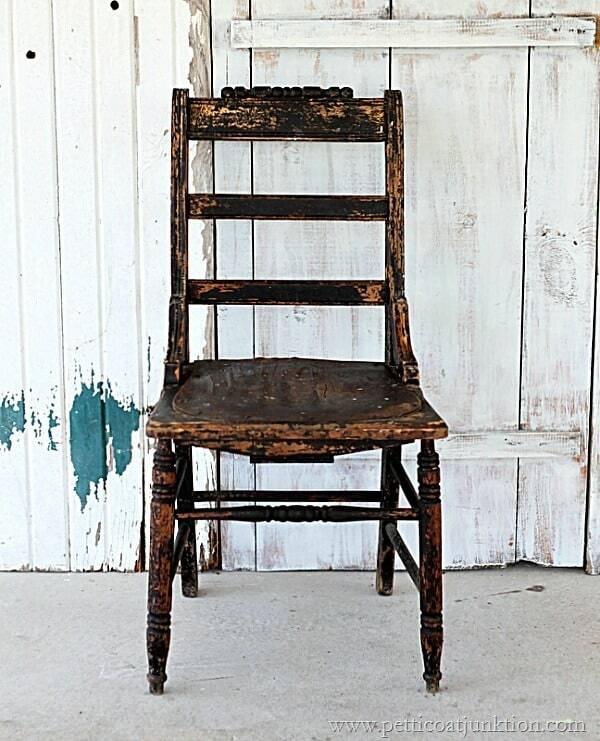 This chair came from the Nashville Flea Market…..
….and so did this one. I keep the chairs around because I really like them and they’re great for staging photos! 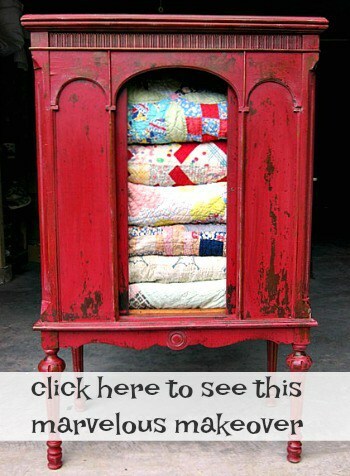 Tell me what you think about he table and share what you did over the weekend…. I found a game board just like that on the curb last year and gave it to a friend. It wasn’t an old one though, looked like a reproduction. 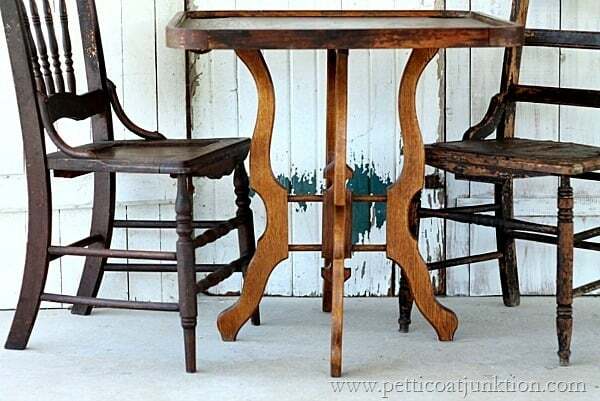 I love how you turned it into a table and the chairs are perfect. Mostly I wanted to stop by and tell you how much I enjoy your makeovers. You have really inspired me! Looking forward to many, many more! Great table! A Belated Happy Birthday, Kathy!!!! 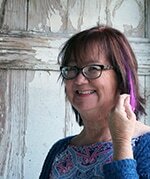 Wellhappy b/d Kathy, wow 60. Wish I was only 60. That sounds pretty durned young to me. Shoot my oldest will be 54 on the 10th. I’ll be 74 later this month. Hope your b/d was great. The years just fly by don’t they? I am not ready to be an old lady. Not type of person to sit watching tv and let my brain go to heck. Got too much I want to do. You must be like that also, you’re always so busy. Are you able to make living on your pieces? wish I could sell some of ours. The market here is not a good one. My birthday was great thank you…and you’re right we can’t just sit around can we? I think 74 is young too! Glad you liked the table. Please keep leaving comments. I love reading them. Happy Birthday Kathy! they look great put together! Hope you had a fabulous birthday! My dad’s birthday is the 5th!! Totally love it Kathy!!! 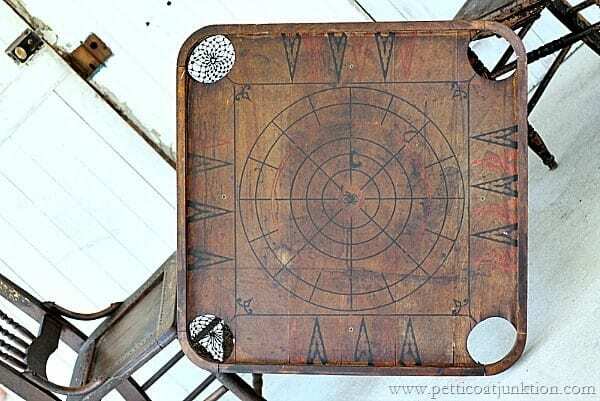 I would love to find an old wooden game board like this. The chairs are beautiful too! I love those chairs..that’s why I can’t seem to let go of them. I see those game boards all the time but some are cooler than others. Happy Birthday! 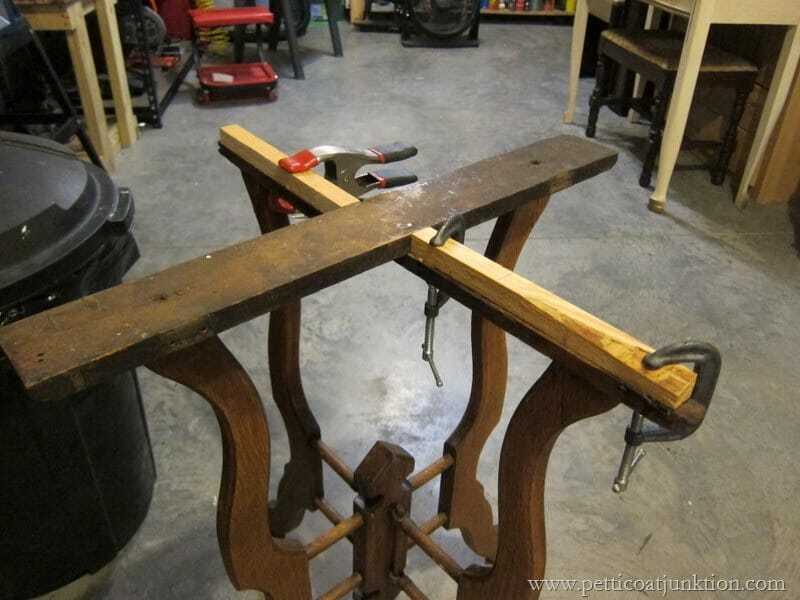 I love the table base legs too, and with the board it’s a great combination. The game table turned out great! Thanks Michelle. I really like those legs too. I really like this. Great idea. I have an old game board about that size I have been wanting to do something with! I love your table. I think it is wonderful the way you buy odds and ends and then you put them together and make something unique and beautiful. 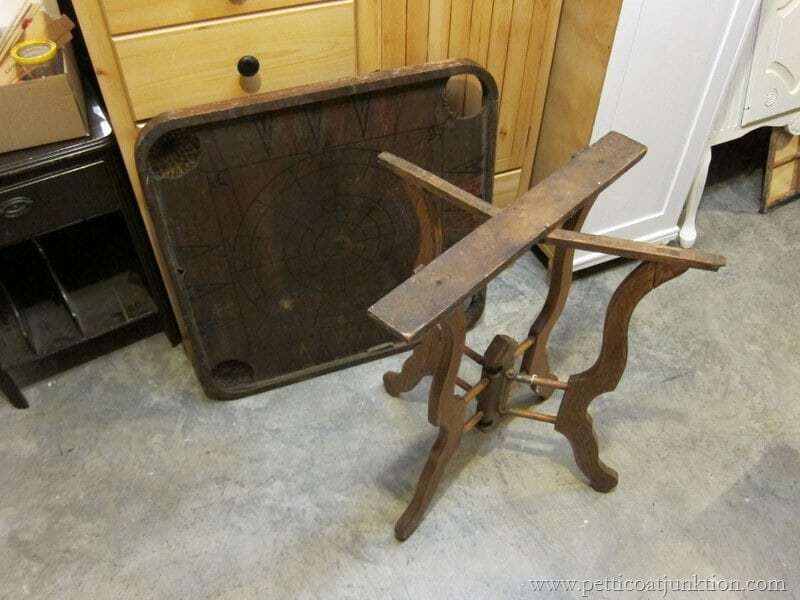 I love primitives and you have a real talent for giving what some people would consider(your odds and ends)trash until you put them together. We had a wonderful long week end, my husband was actually able to come in off the road on Wednesday and didn’t leave until this morning so it was like a vacation for him. The weather was perfect, the mornings were in the low 60’s and the afternoon’s were in the mid to high 70’s and we rode motorcycles all week end except yesterday. My husband took our granddaughter for a ride then her mom, it was just a wonderful relaxing, long week end. Oh and lots of good BBQ. Patty, thanks for the nice compliment! My husband has a motorcycle but I don’t like to ride. I’m glad you enjoy doing this with your hubby. Kathy, love the table you and hubby created. While I love the table I especially like your chairs. Need to ask a question about the Flea Market. 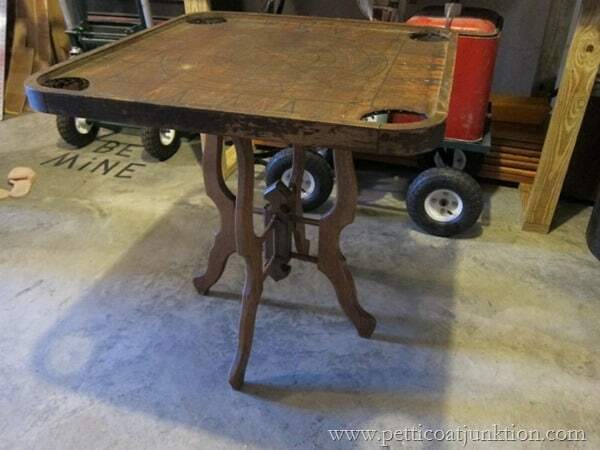 I’m looking for two iron sewing machine bases to use for building a dining room table. Do you see these at the market often and what kind of prices are you seeing? Thanks for the info. 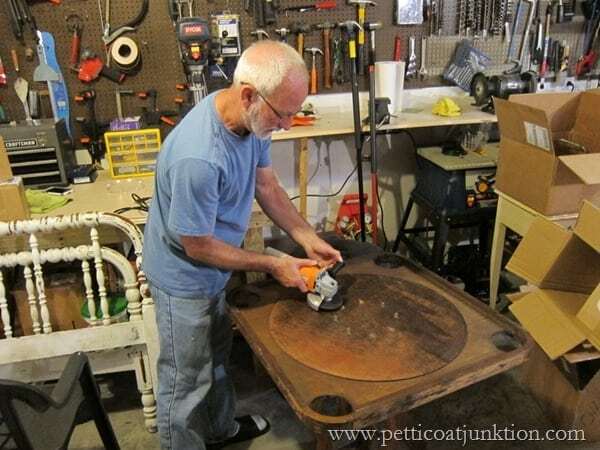 oh, that’s a great idea for a dining room table. I do see them quit often and the price is usually around $25-$30. Good luck finding some. I hope to see you at the market in July!